While the Philippines celebrated the success of its recent hosting of the 12th Association of Southeast Asian Nations (ASEAN) summit from 10 -15 January in Cebu City, the Working Group for an ASEAN Human Rights Mechanism(Working Group), one of the partners of the Friedrich Naumann Foundation (FNF), marked quiet victories in the ASEAN leaders’ adoption of two of its core projects. ASEAN government heads endorsed completely the Eminent Persons Group (EPG)’s recommendations in its blueprint for an ASEAN charter. The EPG is a group of highly-regarded statesmen and leaders. Their proposal noted the possibility of setting up an ASEAN human rights mechanism as a “worthy idea [that] should be pursued further.” This is something the Working Group has been lobbying for consistently for years. Another success for the Working Group is the ASEAN Declaration on the Promotion and Protection of the Rights of Migrant Workers. While it does not contain specifics, it nevertheless is a move towards the creation of a sectoral instrument to protect their rights. It is also a step further in the implementation of one of the Vientiane Action Programme (VAP)’s mandates. ASEAN heads of state approved the VAP during their 10th summit. It calls for political development, conflict prevention and resolution and peace building throughout the region through the promotion of human rights. “ASEAN has come a long way in acknowledging the key role that human rights protection plays in building modern, stable societies,” said FNF Resident Representative Siegfried Herzog. “The Working Group’s contribution to this process has been invaluable,” he added. 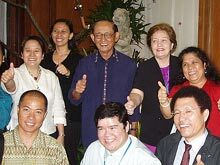 The Working Group has been engaging ASEAN closely since 1996. With the support of FNF, It has been conducting workshops, round table discussions and meetings with senior officials in order to push for concrete action on human rights protection.